Had a great week, but spent tons of time editing manuscripts from Japan and Taiwan! I have to remind myself that I'm retired! Janet and I took Friday off for a girls' day at the mall. She's lost lots of weight and had to have some new clothes...she hates to shop so I had to drag her kicking and screaming until she realized how small she was! Then I had to drag her out to the car to go home! Great sales at Macy's, but I'm just a Dillards kind of girl. Doing some great selling on eBay this week too! Still have one black blazer that no one wants! Libby or Mary...you may be getting a new blazer! Janet's home to Tupelo for a week...we have Bob the Builder cat! He's wandering the house looking for his Mom...finally gave up and jumped up in Woody's lap for his nightly love! He's so affectionate...Harley should learn from him. Today, Woody, Andy and I went to the TACA Arts Fair! Saw Mary Martin...no, not THE Mary Martin! Belle Meade Plantation was having a children's event. Also saw my friend from high school, Rombye. She said the reunion was fun. We missed it, but after looking at the pictures, I didn't recognize but two or three people! Andy was the hit of the Fair in his Titan's visor. Hope you have a great week! A Fabulous Night at the Weber's! Just order a book...100 miles around Yellowstone! We're starting to prepare for our four months in Montana next summer! Today starts the diet and the walking. We can handle 4-6 miles flat or about a mile straight up if we plod! We need to improve our stamina as some of the trails are much longer than the ones we did on the Blue Ridge Parkway. Not sure how I'm going to sneak Woody into walking...he's getting smarter! Have a great weekend...we're going to watch Notre Dame...at least long enough to either be ecstatic or depressed. We're 0-3! Boo hoo! We had an incredible experience last night! Our friends, Bill and Jane Petty, have an incredibly talented son, Bill Petty, Jr, who is the Worship Pastor at NorthPointe Church and a Christian singer. Bill Jr had a launch party for his new CD last night at Ri'chard's Cafe in Whites Creek, TN! It was such an uplifting experience and reminded me of my old "First Baptist" church days in Jackson, TN. You can hear one of his songs at the link above. Some of you may even find a little gift in the mail! I planned on Christmas presents, but like Woody, this is just too good not to get into circulation now! If you want more copies for your friends, just let me know! I'm sure Momma Jane will hook us up at $15 per CD! Bill self produced this CD....do you know how hard it is for me to not say album! The launch part was at Ri'chard's Cafe at Whites Creek, TN - A New Orleans/Cajun Style restaurant and live music venue a few minutes from Music Row and Downtown Nashville. Richard Trest, the owner, was so gracious to all of us...and is a talented singer and song writer in his own right! He's a transplant from New Orleans...it's my new favorite place! It's like the Blue Bird Cafe but with great food! We're going to watch his web site for nights we want to go...but get ready Dinner Club...we're heading to Whites Creek in October if we can all get together on a date! Check out www.richardtrest.com for more on the restaurant. Have a great week! and remember my favorite little prayer that I pray for all my friends, family, and a few people I'm not too fond of...ok...I'm not that good of a person! Father, God bless all my family and friends in whatever it is that You know they may be needing this day! And may their life be full of your peace, prosperity and power as they seek to have a closer relationship with you. Amen. We're finally back in Nashville to see the damage of global warming! Our yard is burned to a crisp but Janet saved our shrubs and my roses. It may be time for a high rise condo with a balcony and one potted plant! We worked all day yesterday in the yard and only got the front and side done! We shaped and weeded and pruned...and, of course, I managed to hack up another extension cord with the hedge trimmer. Thank heaven for ground fault interrupter outlets! I could be a crispy critter without them! It is raining a tiny bit as we speak...don't know that it will help much! Last night we went to the new California Pizza Kitchen! http://www.cpk.com/ The only problem is that it's in Green Hills and the traffic is a killer! It's in the new Hill Center which will be cool once its finished. Food was great...service great...and it was fun watching all the Green Hills group! I don't think I've ever been that trendy! Saw a colleague from Memphis that Janet and I hadn't seen in 25 years! That was a hoot! 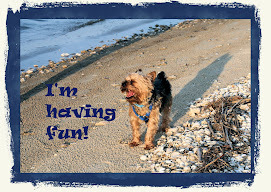 I'm still an editing fool...have lots working...and can't wait to get a check! I'm not sure I like the lag time on payment as I've already spent the money! But, all things considered, I work from home or the RV, when I want, and in some lovely outfits! Donna, I have on your purple socks as we speak! Between Taiwan and Tokyo, I'm staying a bit more busy than I like, but the manuscripts are fascinating. The last one I did was Diapause in the Silkworms of Japan and China! 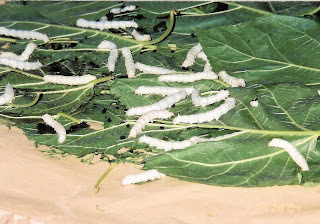 I sent the author a picture of silkworms on mulberry leaves I took in Shanghai to use in his presentation! I think I have an article accepted to the ACHE journal, Healthcare Executive! Waiting to hear. I edited it down from one that I had written related to Transformational Leadership. Hopefully I'll know in the next few weeks! I'm also writing original content for Salem Press's new Cancer Manual...like the Merck Manual but only on Cancer. So far I've done 16 topics! Still selling photographs and entering contests. I've been selected for a few Anthologies, but no money...just the "honor" of selection....I'd rather have money! We're going to watch football all day today! Yeah! Has to be better than Notre Dame!!!! We're 0-2! and you know how that bums me out. It's incredible to be retired and free to roam! I thank God daily for my many blessings...not sure what I did to deserve such a great life! I guess our random acts of kindness continue to pay off...we may not be churchy, but we try to walk the walk! Riley, our granddaughter, caught a foot long fish today with her fishing wand from Wal-Mart that Mimi bought her! Unfortunately, Dad decided he needed bait more than having it mounted for her bedroom wall! At least he told her she had to send it back to the sea...glad she didn't realize what he meant! Jen caught a hammerhead shark! Should have told her to filet it and saute it in real butter and lemon pepper...tasty! Our fishmonger from Florida told us that recipe...works on any fish. I guess shark is shark, hammerhead or otherwise! Libby is off riding her four wheeler that Led gave her for her birthday...I'm not sure what happened...four wheeler, bass fisherperson, cubs fan...at least she still likes to shop! She's happier than I've ever seen her! Molly is moving this weekend...she got a big promotion at work and is really excited about commissions! Yeah...she's the new material girl and I'm the hippie now!!! Talk about role reversal! You go girl! We should be home in a few days unless we find someplace fun to stop and visit! We do love this lifestyle but really miss all of you!